TODAY ONLY WITH CODE "LOVEELFINX"
Official Memo Pad available at Elfinbook.co only, nowhere else! Elfinbook™ Smart Reusable Memo Pad has been upgraded to 2019 version (and FREE SHIPPING today for this grand launch). We also included a 3x Pens ($50 value) as a gift for you when you purchase Elfinbook 2019 today! The Elfinbook™ Memo Pad is built for the digital age while providing a classic pen and paper experience. With the touch and feel of a traditional notebook, the Elfinbook™ is endlessly reusable and connected to all of your favorite cloud services like Evernote, Onedrive, Dropbox and Google Drive. ✅This Memo Pad is designed for the innovator, the artist, the designer, the analyst, architectures and the student. Elfinbook is a Reusable Smart Memo Pad , you can simply wipe off your notes with your microwave oven, hair drier, or with a damp cloth. Works with Elfinbook APP (Android & iOS). Just download Elfinbook app then scan your Memo Pad with Elfinbook APP to store your notes. 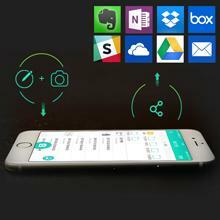 You can also instantly blast your notes into cloud services like DropBox, Google Drive, Onedrive, Yandex. Disk and so on. Easier than ever, you can jot down everything come to mind with Elfinbook, from study notes in class to sketching ideas that you never want to miss. Paper in Elfinbook is made out of stone. All pages are water-resistant and each page of Elfinbook can be used up to 500 times. Please use Pilot FriXion or any other water-based pens on Elfinbook. Oil-based pens are not recommended! It is the endlessly reusable notebook for you. The Elfinbook provides a classic pen and paper experience, yet is built for the digital age. Although it feels like a traditional notebook, the Elfinbook is endlessly reusable and connected to all of your favorite cloud services. When you write using any pen from the Pilot Frixion line, your writing sticks to Elfinbook pages like regular paper. But add a drop of water… and the notebook erases like magic. The Elfinbook notebook is compatible with the Elfinbook app. That means before your notes go off the page they go online to destinations like Google Drive, Dropbox, and Evernote — perfectly organized.